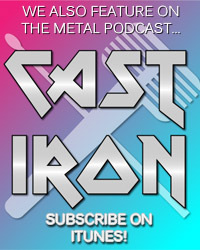 If you missed the show then don’t forget to catch the repeat of Catbird’s Sunday Roasting on Bloodstock Radio at 12pm on Wednesdays. Don’t forget that on the 22nd of December, Jamie Lenman will be in the studio for an interview and a live acoustic session. This Sunday gone (2/9/12) we co-hosted on Catbird’s Sunday Roasting over at Total Rock. For anyone that listened in (and for anyone that didn’t) I’ve compiled the list of tracks we chose. Big thanks to Catbird for having us on the show again and an even bigger thanks to everyone who listened in and supported UK rock and metal.